Lütfü Akdoğan | Who is Lütfü Akdoğan? Born in Samandag, Hatay,Turkey, studied French and Arabic languages. In 1943, he came to Istanbul and enrolled in Haydarpasa high school as a boarding student. After he graduating he enrolled in The Faculty of Law, and began his career in journalism at; “SON SAAT”. He went on to become a leagal affairs and War correspondent at; “YENI SABAH”. 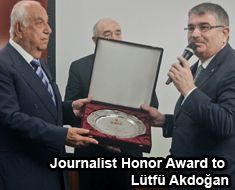 Akdogan, who attracted attention with his successful interviews and remarkable articles, was obliged to leave the Faculty of Law because of his intense work and graduated from the Institute of Journalism, Press and Publication. He attracted all attentions with his unbelievable interviews published in the journal; “TERCUMAN”. In 1957 he was prisoned for 2.5 months due to an article he wrote. Following this he moved on to work at; “AKSAM”. He later became Information Chief at; “YENI ISTANBUL”. He’s first experience of running a newspaper, was with a group lead by Kasim Gulek;“TANIN”. But this entreprise didn’t have a long run because of political circumstances. Finally, he played an important role in reconstructed publishing of the journal “TERCUMAN”, he made “TERCUMAN” the best circulated newspaper of that time and became Ismet Inonu’s private representative. Due to this work and his culture, he assisted in development of political, cultural and economical relationships between Turkey and Arabic countries. At the same term he was deputy of political party; “Adalet” of Konya in 1965-1969. During his deputyship, he worked as a member of Foreign Affairs , Press and Tourism Commissions. He never left of his mission even in his deputyship term and actualized highly important interviews. He showed that he has never lost his love, respect and excitement of journalism, to the new generation and his colleagues, with his interview published in Hurriyet in 1992 _although he was left Bab-i Ali , and later on with TV programs on KANAL 6, NTV, ATV, HABER TURK, FLASH TV, ULUSAL KANAL. -He conduced to the unification of divided Yemen and to terminate the disagreement among the king of Saudi Arabia; Faysal and Nasır, about the subject “Yemen”. -He featured in the Pakistan-India war, in 1964 and enabled Turkey and Iran to aid Pakistan. -He provided blanket, comestible and money to the fighters of the islamic faith, in Eritra. -He prevented a civil war in Somalia. He provided comestible and clothes to Somelia. He attracted the attention of United States and he lightened Turkish public opinion, with his articles. -He helped immigrated Iranians after the Shah escaped from Iran. He worked for they return to their country. -He witnessed the Yemen war. -He witnessed the Yemen-Israel war,in 1956. -He witnessed the Israel War, in 1967. -He witnessed the Iran-Iraq war, in 1980. -He witnessed the Algeria war. -He witnessed the Algerian Revolution. -He witnessed 3 revolutions in Syria. -He witnessed Lebanon civil war. -He traversed the Bar-Lev line of Israel, up and down. -He passed secretly through the Suez Canal, that was closed. -İn 1973, at the war, he took part among the Egyptian soldiers, who landed to Sina. 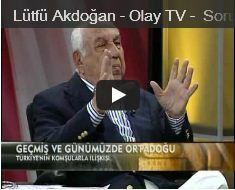 -He interviewed with the wife of Enver Sedat and he revealed her inside to all world. -He afforded for lots of party Chairman who asked his help, to be nominated as Prime Minister again. -He prevented the revolutions which had been planned in lots of Arab country. -He prevented the military coups. -He became intimate with the Arab Leaders. -He came to the children’s rescue who are about to die because of the embargo in Irak and he carried infant food and comestible two times,to the children of Irak, in contravension of embargo.